I am running several WordPress websites and I run them on several different hosters, now in the past months I migrated some of them to Microsoft Azure using the Azure Web Apps. In this post you can see how you can migrate a smiple WordPress blog to Microsoft Azure. 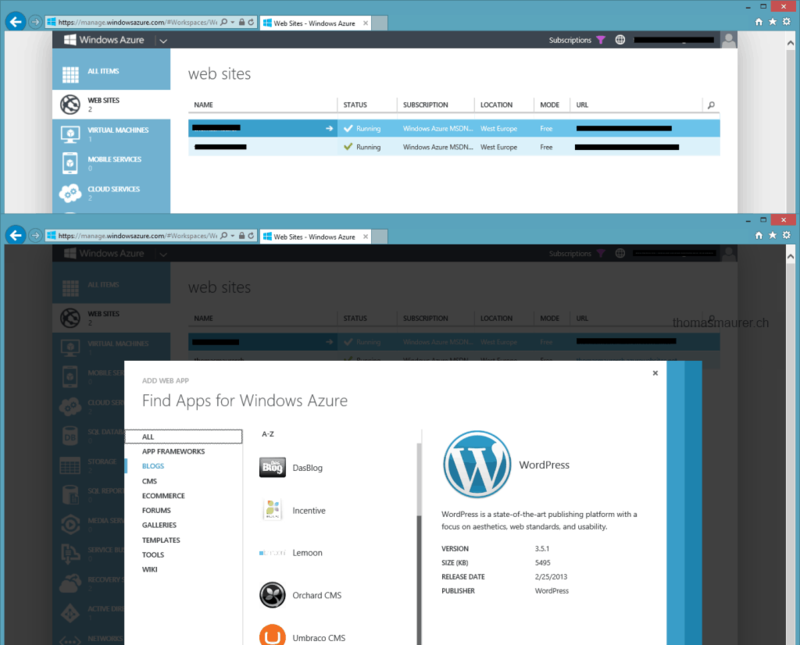 First you have to have a Microsoft Azure account and login to the Microsoft Azure Portal. You can now create a new website from gallery, where you can choose WordPress as an option. You can than start configuring the WordPress website and set it up to use a new database and where it should be located. After you created the website, you can go on the link of the website and configure your wordpress site. To be able to upload themes and plugins you have to enable FTP for you account. In you can do this by changing the deployment credentials. Now what you can to migrate your existing blog to your new Microsoft Azure blog, you can export your WordPress blog and import in in the new WordPress blog running on Windows Azure. In my case I hit a issue with a PHP default setting which was maxupload limited to 2MB, and my WordPress blog export file was bigger than 2MB. Now you can simply change the PHP setting by using a .user.ini..
Microsoft released the Update Rollup 3 for System Center 2012 R2 with a lot of fixes for several product such as Virtual Machine Manager, Data Protection Manager or Orchestrator. This updates to directly affect private cloud deployments and public cloud deployments by service providers by bringing new functionally to the solutions. With that Microsoft also released Update Rollup 3 for Windows Azure Pack which also brings fixes and enhancements. For stand-alone virtual machines (VMs) whose templates specified multiple network adapters, the tenant user cannot associate a particular network to each network adapter.Symptom: If the user is creating a VM that’s based on a template that contains multiple network adapters, the Tenant Site VM extension will automatically assign the first available network. Resolution: The tenant user now has the necessary user interface (UI) to select a particular network for a particular network adapter. Developers who use Web Site Cloud to deploy PHP applications do not have an option to specify PHP 5.5 version.Symptom: If the user wants to deploy a PHP 5.5 application, there is no option to specify that version of PHP. Resolution: The user now has the PHP 5.5 version option. Usage records that contain more than 4,000 characters of resource data are not supported.Symptom: If the Usage Collector encounters a usage record that has more than 4,000 characters, it fails and shuts down the usage pipeline for System Center usage data. Resolution: Some of the instructions in this article involve running an SQL script that will increase the size of the table field to nvarchar(max). Tenants experience unexpected behavior in the portal when they create websites that have the same name in different plan subscriptions that are each on a separate Web Site cloud.Symptom: When a tenant creates two websites that have the same name on different Web Site clouds and subscriptions, the portal may display inaccurate information about one or both of the websites. Resolution: Users can now create websites that have the same name through separate subscriptions and clouds without seeing incorrect information about their sites or subscriptions. 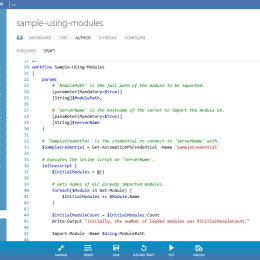 Tenants who create an ASP.NET site by using Web Site Cloud cannot specify whether the Application Pool will be running in Classic or Integrated Mode.Symptom: When a tenant tries to create a website, the user notices that the Application Mode setting is not available. If the application requires Classic Mode, it will run the risk of failing at run time. Resolution: Users can now specify the Application Pool mode for their applications. Administrators cannot use Fully Qualified Domain Names (FQDN) when they configure SQL Always-On Listeners, because the Windows Azure Pack Resource Provider for SQL Server does not support it.Symptom: When an administrator enters an FQDN in the SQL Extension of the Administration site, the SQL Resource Provider accepts it, but an error is returned after the provider tries to process the FQDN. Resolution: FQDNs are now fully supported by the Resource Provider. 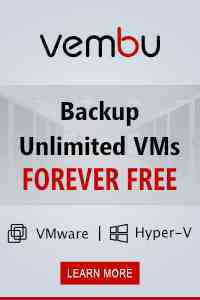 When a tenant creates a VM, the name that is provided is not honored. Instead, a name is generated.Symptom: When tenants build a VM on premises, they expect the name that they provided to be honored as the NetBIOS name of the computer. This is not the case; the VM extension generates a name to maintain uniqueness in System Center Virtual Machine Manager. The numbers are added to the end of the name to guarantee uniqueness in System Center Virtual Machine Manager. The server could not retrieve metrics (Internal Server Error). Resolution: The monitoring service responsible for retrieving the websites data now returns the correct metrics instead of an error. The SQL Resource Provider grants DB Owner permissions to tenants when during database provisioning.Symptom: When a SQL Server Database is provisioned by a tenant, the SQL Resource Provider grants DB Owner permissions to the corresponding SQL login. SQL Server Integrated Security or Windows Authentication is not supported by the Windows Azure Pack Tenant Site SQL extension.Symptom: When the tenant tries to create a database, no option for Windows Authentication is provided. Resolution: The SQL Tenant Site Extension now supports Windows Authentication. With System Center Orchestrator Microsoft already had an datacenter automation engine in his portfolio. Microsoft acquired Opalis added it to the System Center Suite, after a while Microsoft renamed Opalis to System Center Orchestrator. As we have a look at modern datacenters and our cloud environment automation is a key part of it. With the latest release of System Center 2012 R2 and Windows Azure Pack, Microsoft release a new automation engine based on PowerShell Workflows called Service Management Automation (SMA). 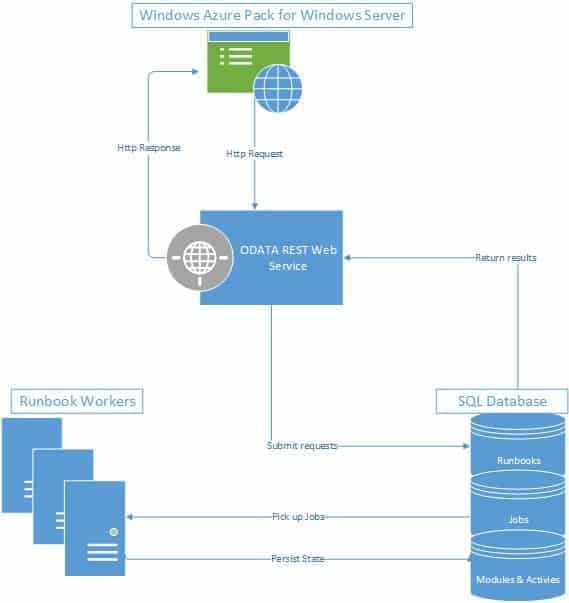 SMA is integrated as one of the key Resource Provider in Windows Azure Pack, and allows you to manage your PowerShell Workflows in so called Runbooks. 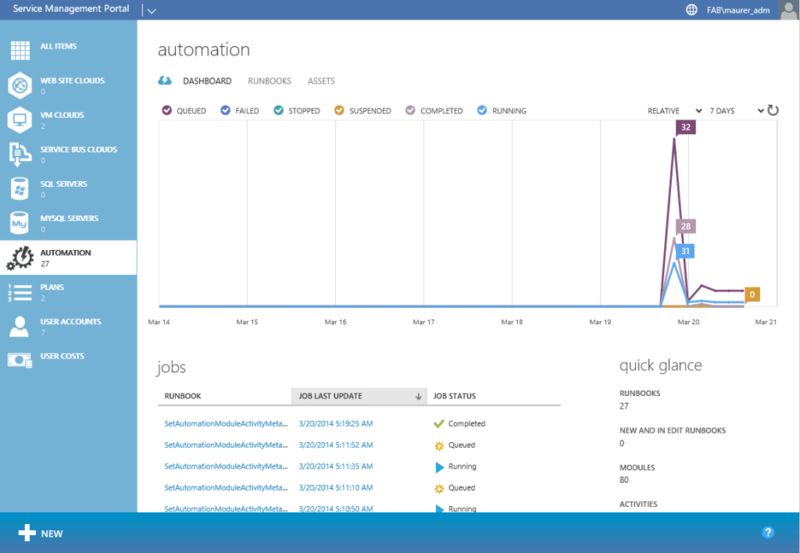 Service Management Automation enhances PowerShell Workflows in several different ways. Centralized store for variables, credentials, certificates, connections, modules, workflows, checkpoints and schedules. SMA is build form several different components. The Automation web service communicates with Windows Azure Pack and authenticates users. The SQL Server databases store and retrieve runbooks, runbook assets, activities, integration modules, and runbook job information. Runbook workers run the runbooks, and they can be used for load balancing. The management portal in Windows Azure Pack is where you author, debug, and start and stop runbooks. One of the greats enhancements Service Management Automation together with Windows Azure Pack brings is the possibility to link runbooks to SPF and VMM activates used in the Virtual Machine Cloud. What does this mean? For example you link a runbook to a Create Virtual Machine activity, so every time a VM gets created the runbooks starts and also gets as input object the VM which was created. This is just one example what you can do with SMA and Windows Azure Pack VM Cloud, there are a lot of other possibilities as well. If you compare System Center Orchestrator to Service Management Automation, SMA looks a little bit more complex if you have used a lot of Integrations Packs in SCORCH but if you have done a lot of work in PowerShell you will really like SMA and see the advantages of it. 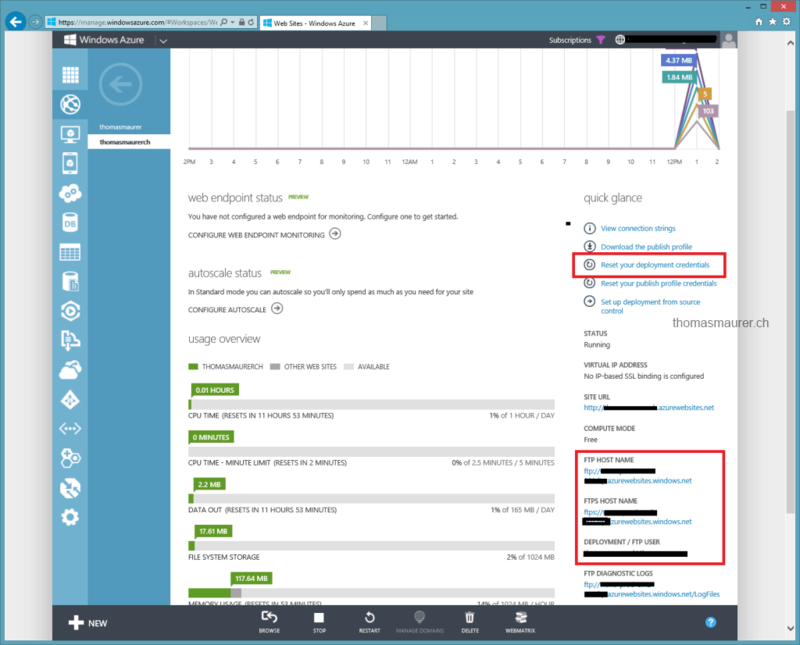 Service Management Automation does not offer an user interface by itself, instead it is using the Windows Azure Pack portal, where admins can author, run, schedule and link runbooks. One of the big features of Windows Azure Pack right now is the integration of a Infrastructure as a Service offering or in other words Virtual Machine Cloud. 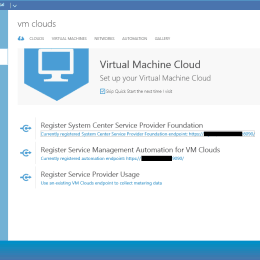 VM Cloud allows you to integrate your existing System Center Virtual Machine Manager 2012 R2 and Hyper-V environment over SPF (Service Provider Foundation) API, so you can create a offering similar to the Windows Azure IaaS experience. I had the chance working on several Windows Azure Pack projects where we have integrated the Virtual Machine Cloud and created offerings for service providers as well as for enterprise companies for internal use. 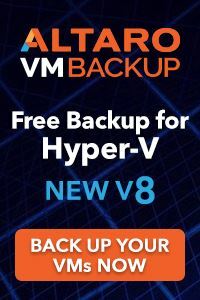 Two parts of I really like about the solution in the integration of Hyper-V Network Virtualization and the integration of VM Roles, which are basically a solution to deploy services instead of just Virtual Machines. Microsoft also finally fixed the issue we had in App Controller and other products to connect to a Virtual Machine via the Hyper-V Console from outside your organization by using a Remote Desktop Gateway. 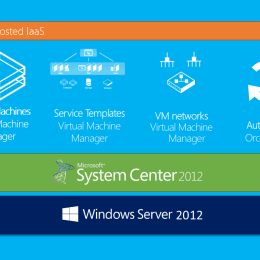 To deploy the VM Cloud or IaaS offering in Windows Azure Pack you need several roles, services and components. If you want to know more about the Windows Azure Pack Architecture, check out the following blog post. 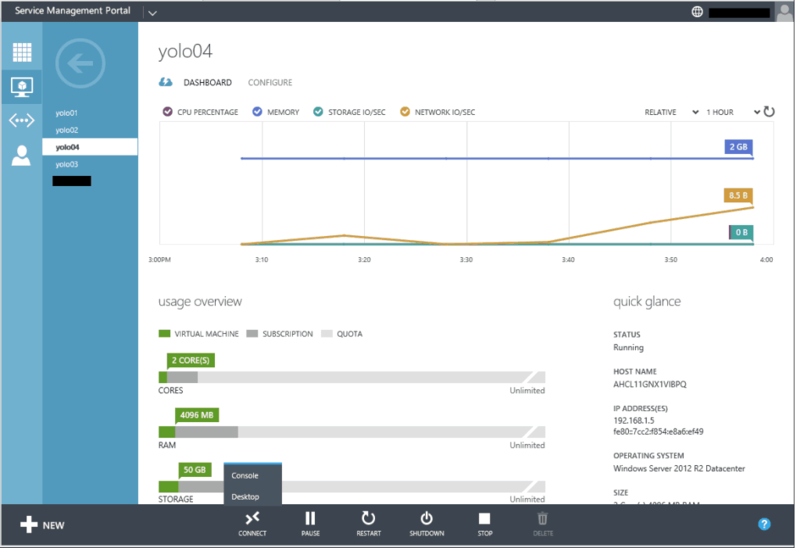 Hyper-V – You need a Hyper-V environment for hosting virtual machines. 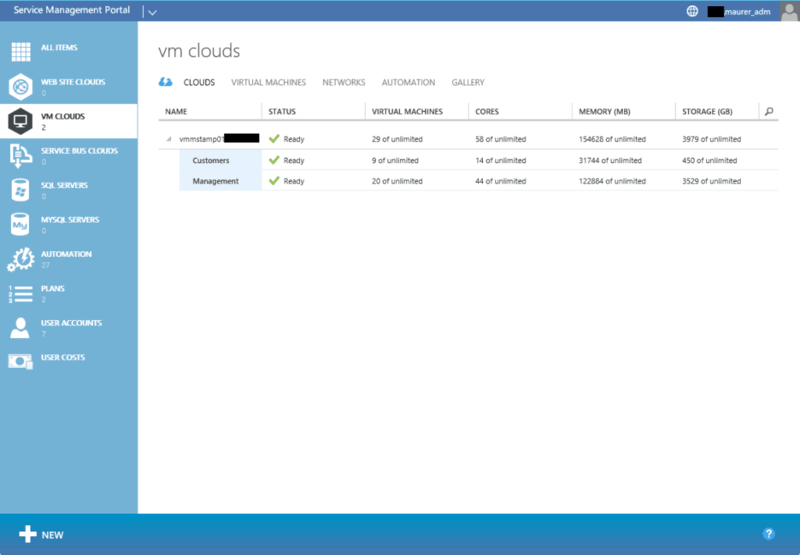 System Center Virtual Machine Manager – In a VM Cloud environment you need your Hyper-V resources to connect to a Virtual Machine Manager. You can connect multiple Virtual Machine Manager servers so called VMM stamps. If you are using Hyper-V Network Virtualization (NVGRE) make sure you build a highly available VMM Cluster for each stamp. 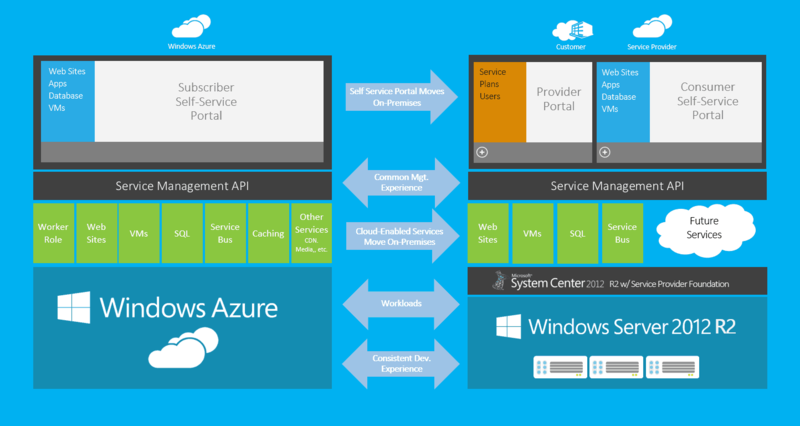 Service Provider Foundation – To bring those VMM stamps inside Windows Azure Pack you need an API solution called Service Provider Foundation. 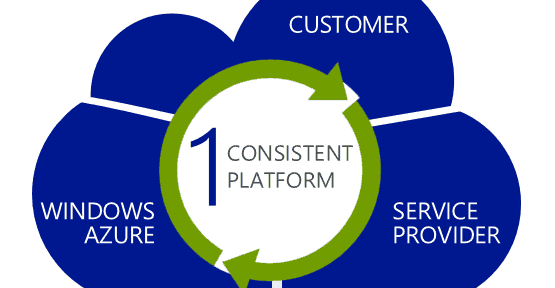 Every VMM stamp has to be registered in Windows Azure Pack trough a Service Provider Foundation Endpoint. Windows Azure Pack Admin Portal – The Portal for Administrator to register new VMM stamps and create offerings for customers. 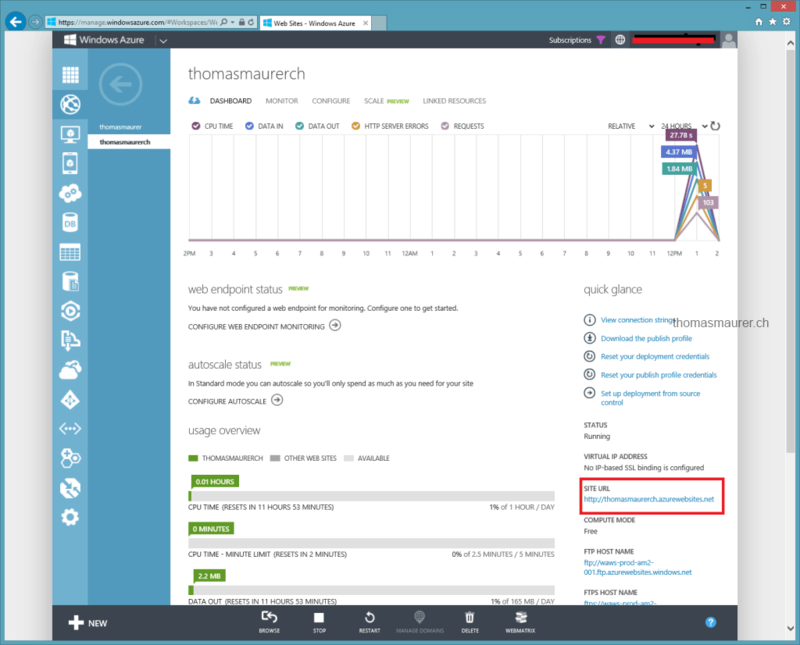 Service Management API – You always need this if you deploy Windows Azure Pack. System Center Operations Manager – If you just want to monitor your VM environment or you want to do chargeback you need Operations Manager and Service Reporting. 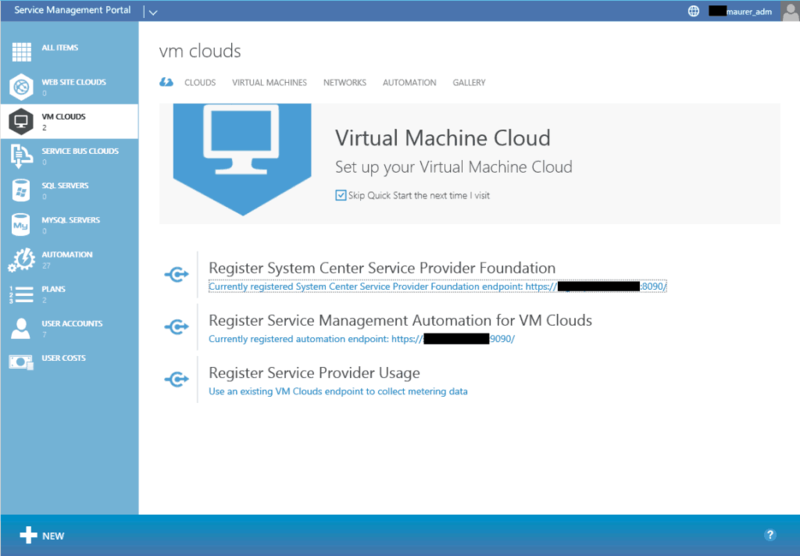 After you have setup your environment you have to register your Service Provider Foundation and VMM in Windows Azure Pack. Enter the address of the SPF Endpoint and the address of the VMM Server. 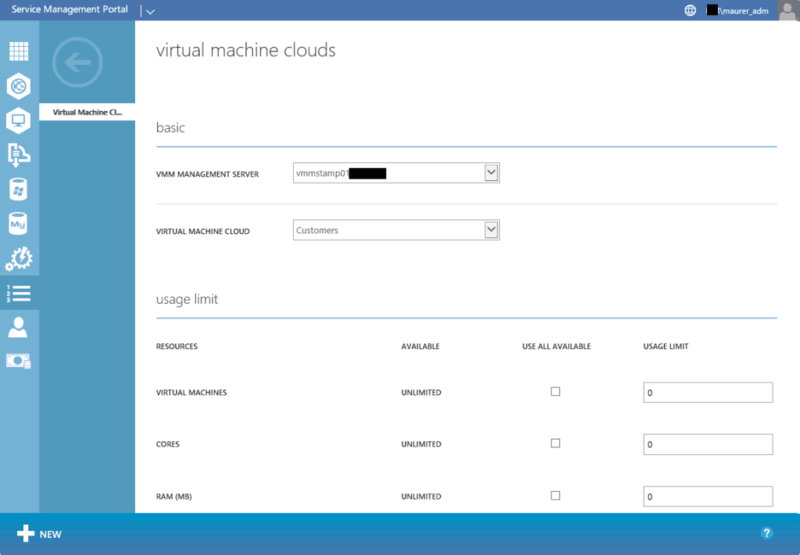 You can than add VMM servers or VMM Stamps to the Windows Azure Pack. You can now select the Cloud you want to use for your offering. If you create a new plan you can select which VMM stamp and cloud should be used for the offering. 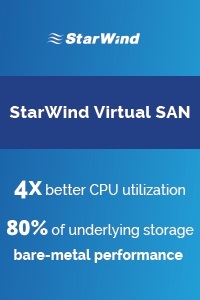 You can limit resources like Virtual Machine count, CPU cores, RAM, Storage, VM Networks, Templates and more inside plans and add-ons. You can than offer these plans and add-ons to your customers. 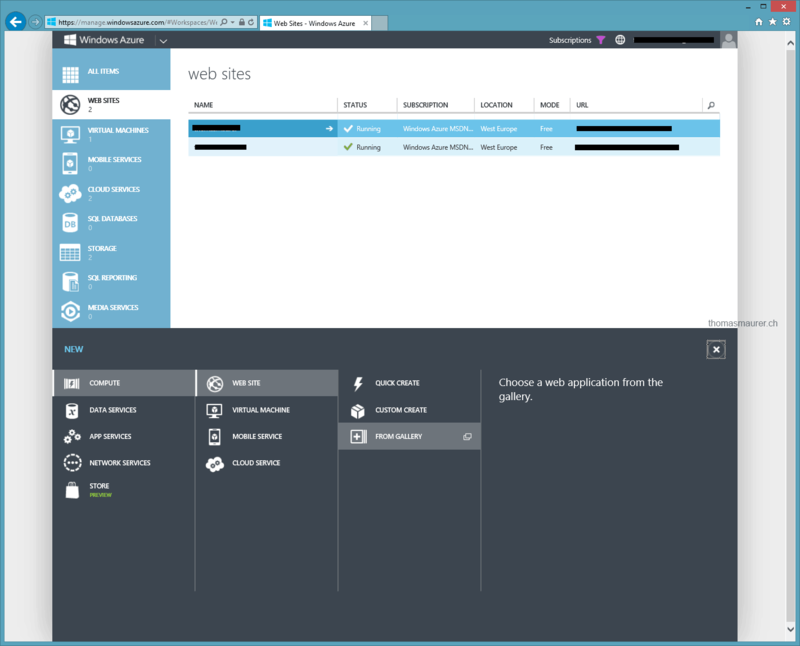 As another part you can extend the solution by adding a SMA Web Service endpoint to the Windows Azure Pack and configure it for the Virtual Machine Clouds. 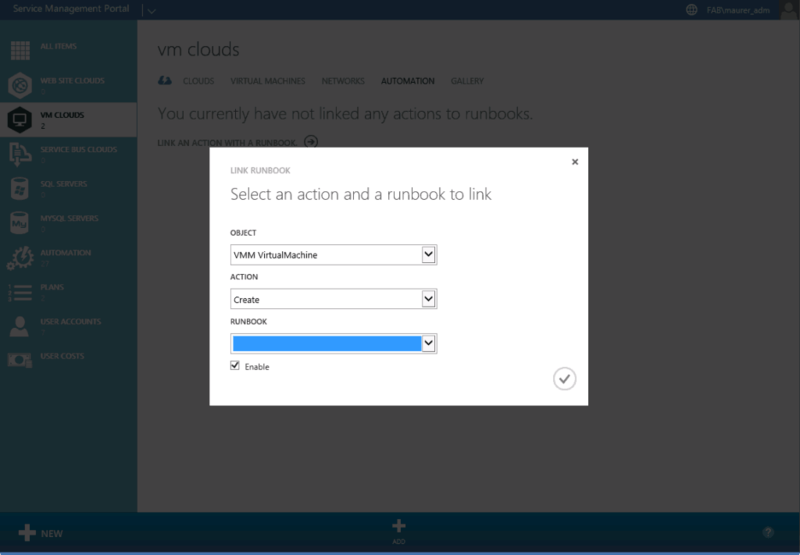 With this solution you can link SMA Runbooks to actions in Windows Azure Pack VM Cloud, SPF and Virtual Machine Manager. If you need to enable Console access to the Virtual Machine to the tenant users, you also have to register a Remote Desktop Gateway. This will allow user to access the Virtual Machine without having a IP address set inside the VM. Remember there are much more steps you have to do. For example configuring the fabric in System Center Virtual Machine Manager or configuring the Remote Desktop Gateway to have access to the Hyper-V hosts. And if you are doing NVGRE (Hyper-V Network Virtualization) you may also want to have NVGRE Gateways in place so customers can leave the Virtual Network and connect to the physical network or the internet. So setting this thing up is one part but having it designed and configured the right way is another. I have worked on some project with Hyper-V Network Virtualization and NVGRE, and today I have seen an issue with Encapsulated Task Offloading on some HP Broadcom Network adapters. I have Hyper-V Hosts running with 10GbE Broadcom Network Adapters (HP Ethernet 10Gb 2-port 530FLR-SFP+ Adapter) with driver version 7.8.52.0 (released in 2014). 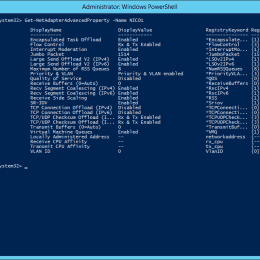 I have created a new VM Network based on Hyper-V Network Virtualization using NVGRE. VM1 is running on Host1 and VM2 is running on Host2. You can ping VM2 from VM1 but there is no other connection possible like SMB, RDP, HTTP or DNS. If you are using a NVGRE Gateway you can no even resolve DNS inside those VMs. 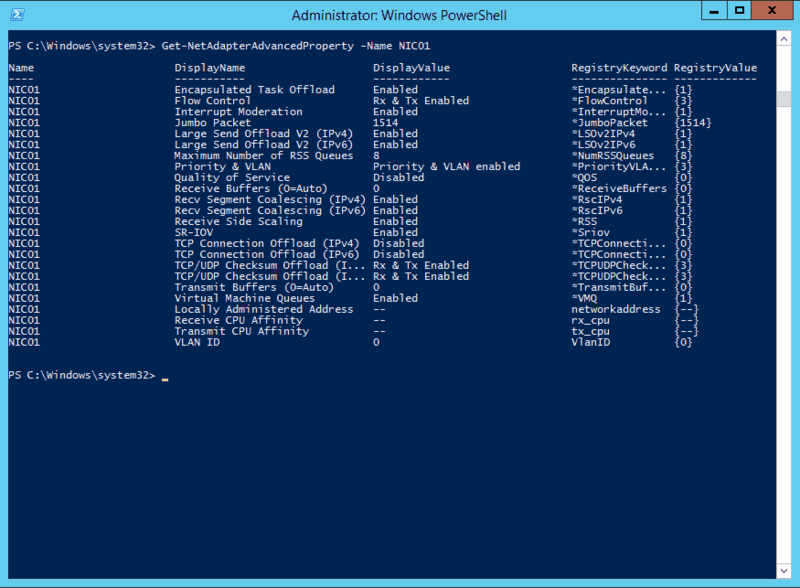 If VM1 and VM2 are running on the same Hyper-V host everything between those VMs works fine. 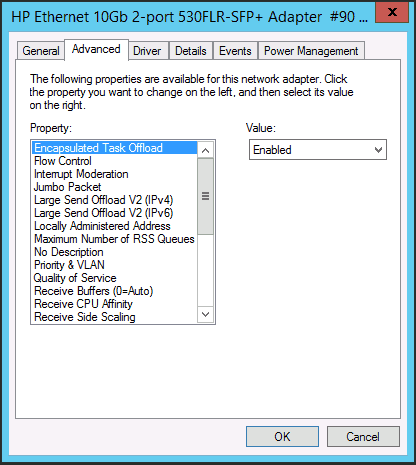 The Broadcom Network adapters have a feature called Encapsulated Task Offloading which is enabled by default. If you disable Encapsulated Task Offloading everything works fine. You can disable it by using the following PowerShell cmdlet. After that connection inside the VMs started to work immediately, no reboot needed. 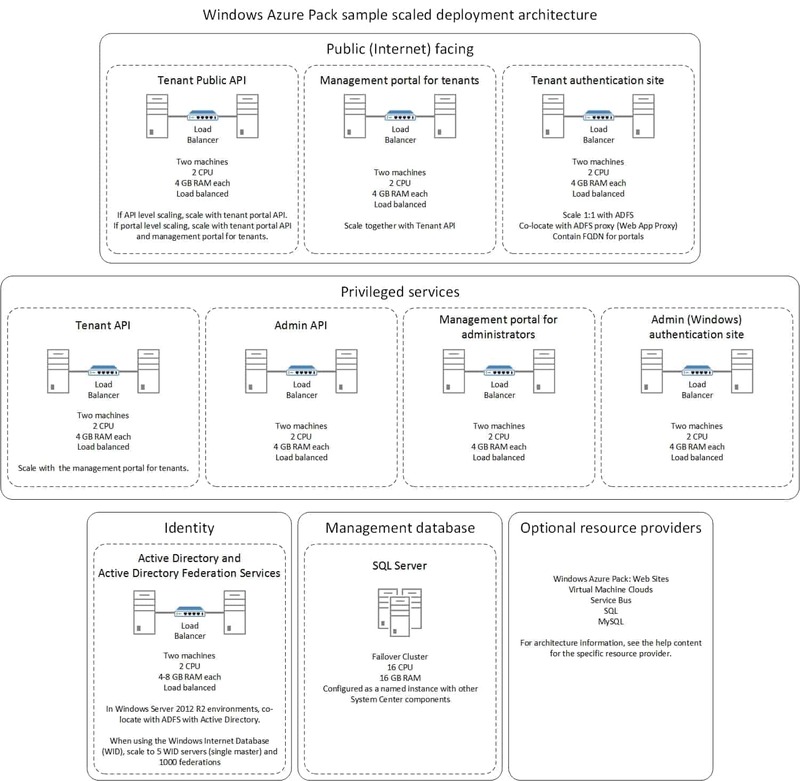 Some days ago I wrote about Windows Azure Pack which basically brings Windows Azure Services to your datacenter on top of Windows Server and System Center. I also showed a little overview how the overall architecture looks like, including the different resource providers such as VM Cloud or SQL Server. 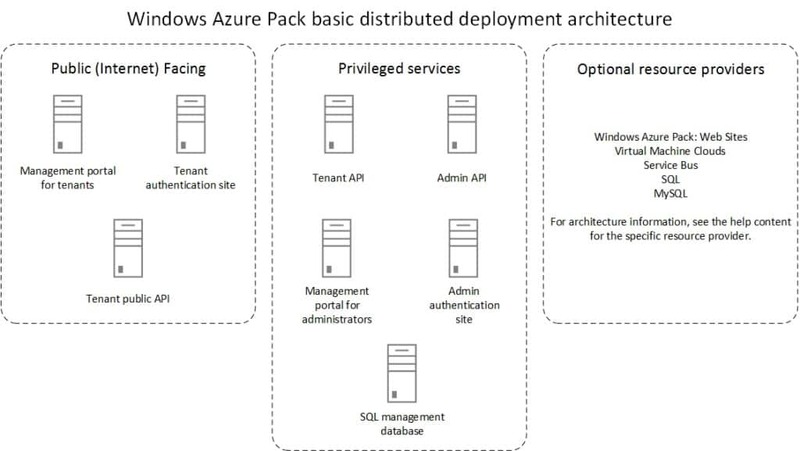 If you a look on the Windows Azure Pack you have 7 different components, which need to be installed. 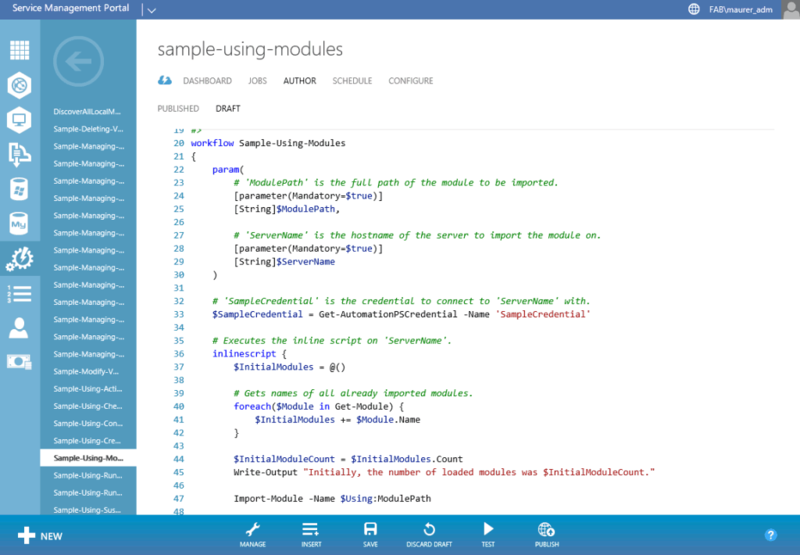 Windows Azure Pack Admin API – The Windows Azure Pack Admin API exposes functionality to complete administrative tasks from the management portal for administrators or through the use of Windows PowerShell cmdlets. Windows Azure Pack Tenant API – Windows Azure Pack Tenant API enables users, or tenants, to manage and configure cloud services that are included in the plans that they subscribe to. Windows Azure Pack Tenant Public API – Windows Azure Pack Tenant Public API enables end users to manage and configure cloud services that are included in the plans that they subscribe to. The Tenant Public API is designed to serve all the requirements of end users that subscribe to the various services that a hosting service provider provides. Admin Authentication Site – This is the authentication site where Administrators authenticate against. By default, Windows Azure Pack uses Windows authentication for the administration portal. You also have the option to use Windows Azure Active Directory Federation Services (AD FS) to authenticate users. Tenant Authentication Site – This is the authentication site where Tenants (Customers) authenticate against. Windows Azure Pack uses an ASP.NET Membership provider to provide authentication for the management portal for tenants. Management portal for administrators – A portal for administrators to configure and manage resource clouds, user accounts, tenant plans, quotas, and pricing. In this portal, administrators create Web Site clouds, virtual machine private clouds, create plans, and manage user subscriptions. Management portal for tenants – A customizable self-service portal to provision, monitor, and manage services. In this portal, users sign up for services and create services, virtual machines, and databases. In addition to the Windows Azure Pack components you also have the Resource providers such as VM Cloud (IaaS), Websites, SQL and more, which integrate in WAP. 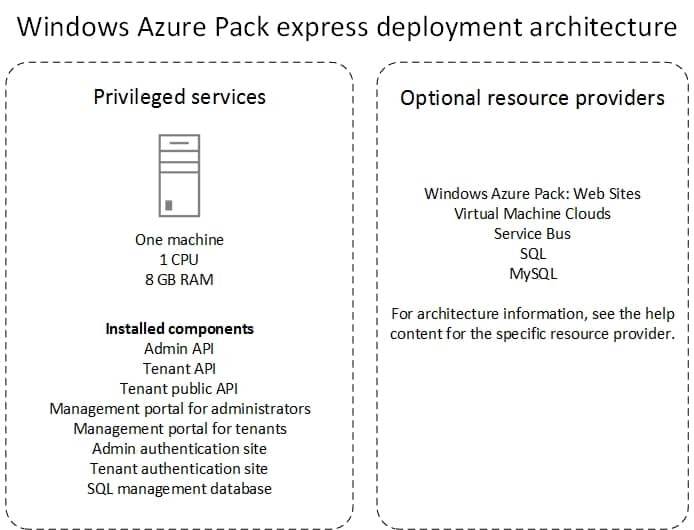 You can install all of the Windows Azure Pack components on different servers and also make them highly available and scalable. First you have to understand that there are multiple types of components, you have the Tenant Portal, Tenant authentication site and the tenant public API which are public and should be accessible for the customers, Tenant API, Admin API, Admin Portal, Admin Authentication site as well as the SQL database behind are so called privileged services which should be protected. Microsoft describes several different scenarios which you can mix. The minimal installation shows you two “servers” or tiers, one for the public facing services and one for the privileged services. To make them highly available you would have two servers for each tiers behind a load balancer. The make the deployment more scalable you can split up the different components on different tiers. Well and Microsoft also offers you an express installation which should only be used for lab or proof of concept installations. This installs all the needed components on to a single server. At the end you and the customer have to decide how you deploy your environment based on scale, availability and security. 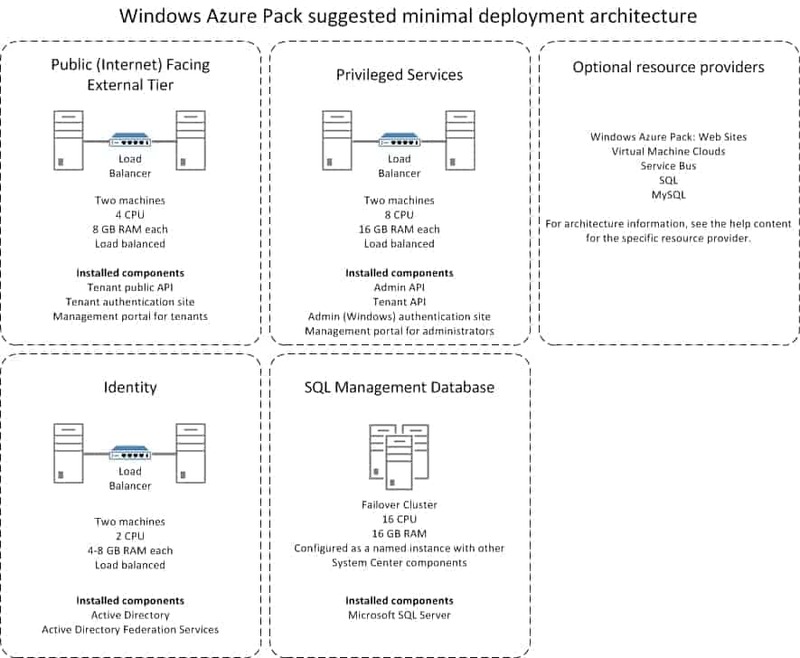 You can get more information about the Windows Azure Pack Architecture on TechNet. In March and April I will present together with Microsoft and itnetx in webinars about the Microsoft Cloud OS. The webinars will be free and will cover an overview about the Microsoft Cloud OS. The Microsoft Cloud OS is the story behind the latest releases of Windows Server 2012 R2, Hyper-V System Center, Windows Azure Pack and Windows Azure. The webinar series will be split in three different sessions and will cover how you can plan, build and operate a Microsoft Cloud and how you can bring the Private & Public Cloud together to make use of a Hybrid Cloud model. 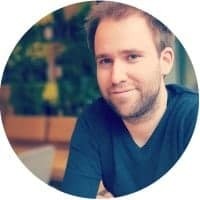 All three webinars will be free and will held in German.